Posted at: 8/19/2010 08:51:00 AM . 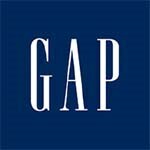 Today's Groupon deal for Philadelphia is $25 for $50 worth of apparel at Gap. It's not valid online, but from what I can tell most of Groupon's cities have this deal today.